With some 30,000 currently recognized species, the true bony fishes or teleosts, which belong to the Neopterygii, account for more than half of modern vertebrate diversity. In collaboration with her Argentinian colleague Emilia Sferco, LMU paleontologist Adriana López-Arbarello, who is in the Paleontology and Geobiology Section at the Department of Earth and Environmental Sciences and is also a member of the Geobiocenter, has undertaken a new analysis of the group’s family tree. Their results, which shed new light on 250 million years of evolutionary history, appear in the online journal Royal Society Open Science. More than 99% of the species of Neopterygii in the world today belong to a single lineage, the true bony fishes or Teleostei. Relative to the rich diversity of the teleosts, the other two neopterygian lineages are strikingly impoverished. The Ginglymodi are made up of the seven recognized species of gars, and the Halecomorphi ¬now consist of a single species, Amia calva, commonly known as the bowfin. In their heyday in the Mesozoic – the Age of the Dinosaurs – the picture was very different. At that time, the Ginglymodi and the Halecomorphi were highly diverse, and they dominated the oceans and freshwater habitats, while the teleosts were a much more modest presence in the world’s waters. The huge difference in the numbers of extant species assigned to the three groups makes it extremely difficult to unravel the relationships between them. However, fossil specimens can help to correct this imbalance, and thus make it possible to elucidate their 250-million-year history. 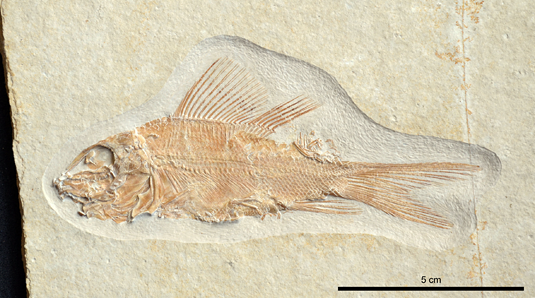 “In fact,” says Adriana López-Arbarello, “our study was motivated by the discovery of one very unusual fossil genus.” Specimens of this genus, dated to 240 million years ago, which exhibit traits characteristic of both the Ginglymodi and the Halecomorphi, were recovered by a Swiss team from an important marine fossil Lagerstätte in the Alps. Their discoverers invited López-Arbarello to participate in the anatomical investigation and description of their finds. Later, López-Arbarello und Sferco took up the task of working out how the new genus fits into the neopterygian family tree. To do so, they assembled the largest morphological dataset yet constructed for fossils of this subclass. Phylogenetic analysis of these data revealed that Ginglymodi and Halecomorphi are more closely related to each other than either is to Teleostei. This confirms what has been regarded by many paleontologists as a controversial notion – namely that the first two taxonomic groups share a common ancestor, and can therefore be subsumed into a single common taxon. In addition, the new study shows that, in the Mesozoic, all three lineages underwent several rapid adaptive radiations, i.e. during which large numbers of novel species evolved over comparatively short periods of time. Not only were Ginglymodi and Halecomorphi represented by enormous numbers of species, these species were characterized by a broad spectrum of morphological and ecological specializations. Indeed, some of the most impressive Mesozoic fossils belong to these lineages. One example is Scheenstia maximus, which grew to a length of nearly 2 meters.